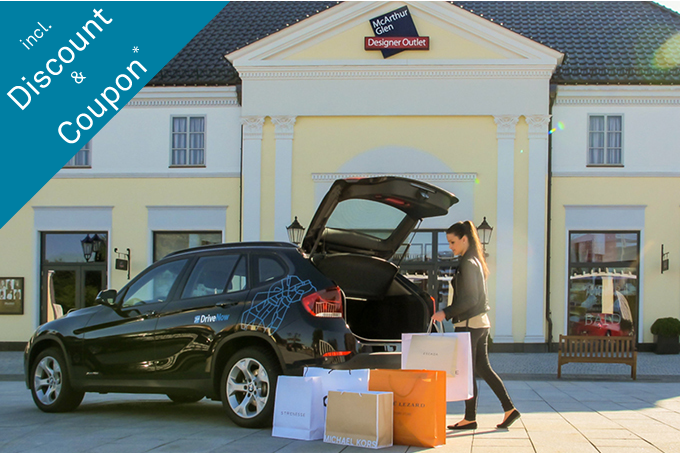 Enjoy the Designer Outlet Parndorf with DriveNow! The McArthurGlen Designer Outlet in Parndorf, open all year round, sells a fantastic number of designer and lifestyle brands, up to 70% cheaper than the manufacturer's recommended retail price. You even get an extra special discount with DriveNow! The price depends on the number of passengers. Please kindly notice that our Shopping Package is not available on Sundays & Public Holidays. If you rent a DriveNow car for immediate use, you can book the Experience Package directly in the car. Simply jump in, log yourself in and go to "Experience Packages" in the booking summary. You can now select the package you'd like, enter the number of passengers and book the package. That's all there is to it! We'll send you a confirmation via SMS and email with your booking number, which you'll need to show in the Information Office. Important: When you get there, don't forget to activate the "Take a break" mode when you park your car. When you've finished your reservation in the app, go to "Packages" and click on "Experience Packages". Simply select the package you'd like, enter the number of passengers and book the package. That's all there is to it, to save! We'll send you a confirmation via SMS and email with your booking number, which you'll need to show at the entrance.